Like most in golf media, I’ve got a cabinet crammed with more than 200 caps – – tee prizes from tournaments, handouts from club pros and gifts from resort and visitors bureau reps who would like publicity. Since most of the hats are seldom worn, the stash is essentially a lifetime supply. And also like most in the sport’s media, I consequently never buy golf caps. An exception might be made, however, for Imperial Headwear’s new line of noodle-toppers, featuring stout sun protection from ultra-violet rays, and fabric technology that can keep a golfer’s head drier and more physically cool on hot days. Psychologically cool is, of course, an entirely different matter, beyond control even for an innovative, century-old company. The notion that any type of apparel could be “performance,” suggesting it leads to longer drives or more accurate putts, is an awfully bold contention. A performance hat is akin to a bottle of “artisinal water,” a marketing stretch of some proportion. Then again, if a hat or piece of clothing helps keep a player more comfortable on hot, cold or rainy days, the assertion has at least some merit. And after wearing Imperial’s hat for several rounds in 80-degree-plus conditions, it’s clear the so-called Coolcore product does perform as promised. Exceptionally light weight, the hat’s fabric wicks away sweat from the head and brow, and instead of pooling around the bottom band, distributes the moisture throughout the now-damp hat. More remarkably, it doesn’t sport discoloration and stains. After a few days of use, most of my other hats look straight out of Duck Dynasty. The Imperial Coolcore is clearly a different kind of hat. It even features an SPF rating. Free of chemicals, polymers, gels, crystals or phase changing materials – – which is what ensures Coolcore fabrics don’t wash out or degrade – – these hats deliver three distinct functions, including moisture-wicking, moisture transportation to accelerate drying, and regulated evaporation for a cooling effect. It works thanks to a patented fiber construction, in which three types of fibers are engineered to producing the wicking and transport effect, which in turn accelerates the evaporation rate and cooling effect. These fabric formulations earned Imperial the prestigious “Innovative Technology” recognition from the Hohenstein Institute, a German organizations with worldwide operations, which does testing, research and certification work for the textile industry. 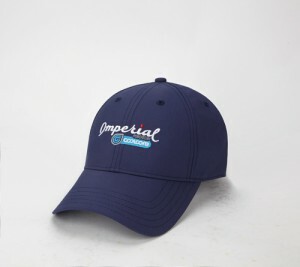 Founded in 1916, Imperial Headwear is a leading manufacturer and marketer of premium quality hats for the golf market. Known for its customer service and art customization capabilities, Imperial products feature innovative digital design, logo and embroidery technologies. The Coolcore collection consists of nine headwear styles, ranging from caps and visors to sun protection hats, in a myriad of colors. For more information go to http://imperialsports.com/ or call (800) 950-1916.